A native of Salzburg, Gustav Kuhn studied conducting with Hans Swarovsky, Bruno Maderna und Herbert von Karajan at the Conservatories in Vienna and Salzburg and graduated from the Salzburg University in philosophy, psychology and psychopathology. Kuhn was only 24 years old when he won the prestigious international conducting competition of the Austrian Broadcasting Corporation (ORF). From 1970 to 1977 Kuhn worked as choirmaster and conductor at the Istanbul Opera House, then as First Chapel Master at the Dortmund Opera House. During this time he already gave guest performances in Palermo, Naples and Bologna. Later he had engagements as guest director in Rome, Florence, Venice and Zurich. Gustav Kuhn also conducted the Berlin Philharmonics, the Dresden State Orchestra, the Israel Philharmonic Orchestra, the London Philharmonic Orchestra and the London Symphony Orchestra, the Royal Philharmonic Orchestra, the Orchestra Filarmonica della Scala in Milan, the Orchestre National de France in Paris, the Accademia Nazionale di Santa Cecilia in Rome, the NHK Orchestra in Tokyo, and, last but not least, the Vienna Philharmonic Orchestra. In 1974 Kuhn founded the Institute for Aleatoric Music in Salzburg. In 1977 he made his debut at the Vienna State Opera with Richard Strauss’ Elektra; only a year later, in 1978, he debuted at the Bavarian State Opera and the Salzburg Festival. During the following season Maestro Kuhn made his conducting debut at the Royal Opera House, Covent Garden in London and was appointed as General Music Director in Bern; in 1980 he opened the Glyndebourne Festival. More debuts followed: 1981 with Fidelio in Chicago; 1982 with Così fan tutte at the Paris Opera; 1984 with Tannhäuser at Milan’s Scala; 1986 with Un ballo in maschera at Arena di Verona. In 1986 Gustav Kuhn started to direct and produce operas to achieve a greater artistic union between a work’s visual and musical components. He produced and staged The Flying Dutchman (Trieste), Parsifal (Naples), Salome (Rome),Don Carlos (Turin), Don Giovanni (Festival di Macerata), Rossini’s Otello (Berlin, Braunschweig and Tokyo), La Bohème (Tokyo), Ariadne on Naxos (Milan), Falstaff (Tokyo), among others. Kuhn stayed with the Salzburg Festival until 1997 (1989 Un ballo in maschera; 1992, 1994 and 1997 La clemenza di Tito). From 1983 to 1985 Kuhn was general music director at the Bonn Opera, followed by engagements as head conductor of the Teatro dell’Opera in Rome and later as artistic director of the Teatro di San Carlo in Naples. From 1990 to 1994 he directed the music festival in Macerata. Gustav Kuhn has been the artistic director of “Neue Stimmen,” an international singing competition held in Gutersloh and sponsored by the German Bertelsmann Foundation, since 1987. In 1992 he instituted the Accademia di Montgral, headquartered at the Convento dell’Angelo in Lucca (Tuscany) since 2000. In 1997 Kuhn initiated the Tyrolean Festival Erl, a few years later the concert series Delirium and the South Tyrol Festival (Toblach / Dobbiaco). 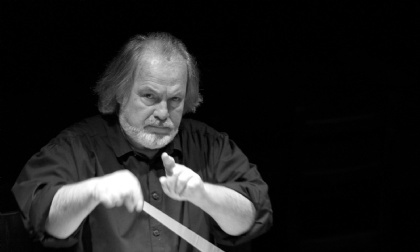 Kuhn is also the artistic director of the Haydn Orchestra of Bolzano and Trento, has written numerous pieces of music (including e. g. the instrumentation of Janáček’s Diary of One Who Disappeared, Edition Peters), and is the author of the book Aus Liebe zur Musik, published by Henschel Verlag, Berlin. The complete recording of Ludwig van Beethovens grand oeuvre! Played by the Haydn Orchestra of Bolzano and Trento and conducted by Gustav Kuhn.